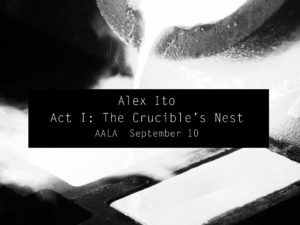 Alex Ito, Act I: The Crucible’s Nest (2016). Installation view. Courtesy the artist + AA|LA, Los Angeles. Alex Ito, 'Ghost Rack II' (2016). Installation detail. Courtesy the artist + AA|LA, Los Angeles. Alex Ito, 'Ghost Rack I' (2016). Installation detail. Courtesy the artist + AA|LA, Los Angeles. Alex Ito, 'Value of Heart' (2016). Install view. Courtesy the artist + AA|LA, Los Angeles. Alex Ito, 'Lives For Shares' (2016). Install view. Courtesy the artist + AA|LA, Los Angeles. Alex Ito, 'Man Made Morals' (2016). Install view. Courtesy the artist + AA|LA, Los Angeles. Alex Ito, 'Born As Work' (2016). Install view. Courtesy the artist + AA|LA, Los Angeles. Alex Ito, 'Crucible’s Nest' (2016). Installation detail. Courtesy the artist + AA|LA, Los Angeles. Alex Ito, 'My Mirror, My Cage' (2016). Install view. Courtesy the artist + AA|LA, Los Angeles. Alex Ito, 'Crucible’s Nest' (2016). Install view. Courtesy the artist + AA|LA, Los Angeles. One of the more intriguing and unique aspects of the LA art scene is the multitude of spaces in which art is shown. Often these galleries (white cube, a friend’s garage, or otherwise) serve as a neutral backdrop for whatever show exists within them. Smooth, whitewashed walls and forgettable floors comprise the gamut of exhibition venues. Alex Ito’s Act I: The Crucible’s Nest, running at Los Angeles’ AA|LA September 10 to October 22, opposes this unspoken standard, and in doing so opens up a dialogue all its own. The New York-based artist ruptures expectation by interrupting the ‘norm’ of art environments. This lends itself to his show, with its main concept centered on conventions and aesthetic perception, as well as the multiple and commercial production of objects of ‘beauty’. Preceding a sequential exhibition, Act II, happening at Baltimore’s Springsteen gallery in mid-October, Act I: The Crucible’s Nest sticks to its title. The gallery space becomes a melting pot of points and counterpoints, a safe place to be uncomfortable and question how we see and exist around art. One of the more glaring landmarks of Ito’s show is the brand new, sand-colored industrial carpet laid out on the floor. This office-grade, acrylic textile literally creates a platform of falsity upon which the exhibition exists. The strong smell of plastic permeates, enhancing the already bizarre and off-kilter pieces on display. ‘My Mirror My Cage’ (2016) is a recognisable artefact — a white leather recliner. Situated in an otherwise lonely corner of the gallery, it is punctured in a number of places by thin steel rods. The rods, though not overtly violent, render the chair unusable — making it impossible for someone to sit comfortably in it, stripping the sculpture of its utilitarian associations. Reflecting this piece are two sculptural pieces, drilled directly into the carpet. ‘Ghost Rack I & II’ (2016) exist as delicate yet immovable tree-like fixtures. Off several protruding metal ‘arms’ hang the taxidermy bodies of white mice, caught in moments of suspenseful distress as they appear to hang on for dear life. Also mirroring below are rodent-sized, blown glass sculptures with similar formal qualities to the dead mice, but abstracted beyond confident recognition. Ito’s sculpture ‘Crucible’s Nest’ (2016) is made in the likeness of a coffee table. Atop its surface, trapped beneath a standard pint glass, we come across another example of the by now repeated taxidermy mice. Literally caught in a corner, the mouse is across the low, black wood table from a clear glass decanter, filled with an opaque black liquid. This decanter, simultaneously decorative and unnerving is emulated in the series of paintings hanging along the gallery walls. Alex Ito, ‘My Mirror, My Cage’ (2016). Install view. Courtesy the artist + AA|LA, Los Angeles. Each large painting features the same glass vessel we see in ‘Crucible’s Nest’ (2016), filled with the black substance. Hand-painted and identical in shape and size, we pick up again on the theme of multiplicity, reproduction and how these facts permeate art and commercial art markets. The differences between each painting lies in the text superimposed over the decanters. The bold letters form abstract sentences, making the entire series of paintings come across as a monotonous and eerily violent advertisement-like body of work. Alex Ito’s Act I: The Crucible’s Nest running at Los Angeles’ AA|LA September 10 to Oct 22, 2016. Header image: Alex Ito, ‘Ghost Rack II’ (2016). Installation detail. Courtesy the artist + AA|LA, Los Angeles.